The offseason begins today, and with it an avalanche of free agent speculation, trade rumors, and general strategic talk. I think the Indians will be much more active this winter than they have the last two offseasons, my basis for this being their 2018 performance (in both the regular and postseason) as well as the payroll itself. I hope these two charts will clearly illustrate why I think this will be a wild hot stove season. First, let’s look at the team’s performance in 2018. 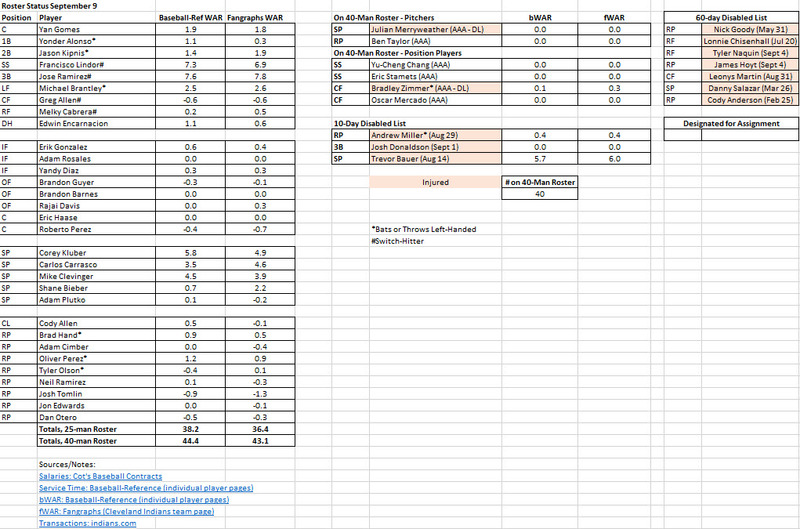 The above is one of my typical Excel charts listing the Indians’ 25-man/40-man rosters. There are a couple new things added that may be useful in providing some context that has been missing from these rosters: a comparison of total team Wins Above Replacement to the team’s competition in the American League. After all, what good is a statistic unless you have something to measure it against? I averaged the two flavors of WAR for each AL team, and ranked them at the bottom-right of the chart. I bring up these 2018 team numbers in order to focus the scope of offseason prognostication somewhat. I submit that if the Indians accumulate 50.6 WAR in 2019, they’ll make the playoffs again. Heck, they may make the playoffs if they hit 45.0 WAR if the rest of the AL Central continues to languish, but I don’t want to assume that, and neither should the Cleveland front office. Heck, if the competition in the AL Central gets better, it will be harder for the Indians to replicate that performance. So for the sake of this exercise, assume that the Indians will need to at least get to 50 wins above replacement. This second chart concentrates more on the financial end of the equation. The Indians ended 2018 with a roughly $137,400,000 payroll. The chart isn’t capturing the exact number, because the salaries of released players aren’t included, and many of the players on the list only made a partial salary (as they spent portions of the season making a minor-league salary), but it’s close enough for my purposes. Of that $137.4M salary, about $45M is going away via free agency, but a large portion of that savings is going to be eaten up by organic (arbitration and contract salary increases) growth. To approximate the 2019 payroll if the Indians stand completely pat (letting all free agents walk, keeping everyone else), I’ve added back salaries for internal replacements for the free agents; for example, Tyler Olson/Neil Ramirez/Cody Anderson/Danny Salazar replacing the three free agent relievers plus Josh Tomlin. I calculate that the Indians, if they keep everyone on the roster that isn’t a free agent, will have an Opening Day payroll of $128,500,000, leaving the team about $9-10M to spend on bringing in new players if the salary budget remains the same in 2019. Given that the free agents were worth 5.5 bWAR (and that includes the -0.9 bWAR that Josh Tomlin “contributed”), they aren’t going to be able to pay market value by signing free agents to make up for that lost production and be able to maintain their 2018 payroll (the market rate was between $8-9M/WAR last year). They should be able to replace some of that production with lower salary players (Yandy Diaz, for example, could help on that front as an everyday player), but there aren’t a lot of young players on the cusp of stepping into full-time roles. Maybe Tyler Naquin finally has a breakout season in right field, maybe Cody Anderson becomes the next Bryan Shaw, and maybe Danny Salazar becomes an elite closer, but I wouldn’t bet on all of these things happening. So the Indians will need to both cut payroll and add talent. Cutting payroll could be as simple as non-tendering players like Danny Salazar, who is probably going to make $5M in arbitration, trading players like Jason Kipnis or Yonder Alonso in partial salary dumps, or even dealing core players like Trevor Bauer or Corey Kluber for total salary relief and young/talented players. Note that I’m not endorsing trading Bauer or Kluber unless the absolutely perfect deal comes around, but with the Indians’ circumstances, it’s a possibility. The Indians could also strip mine their farm system (where the talent is heavily concentrated in the lower rungs of the system) in order to patch the holes, putting all their eggs in the 2019-2020 baskets, all but ensuring the years after that will see a total rebuild. One other thing to keep in mind is that several of the big market teams, after a couple years of restraint, are going to be extremely aggressive in free agency. The Yankees in particular are poised to spend wildly after having gotten under the luxury tax threshold in 2018 (thus avoiding a 50% surtax). That will affect not only the big names in free agency, but will have a trickle down effect on the lower tier free agents. That will make things more difficult for a team like the Indians to spend in free agency, but it might also make players like Kipnis and Alonso more attractive to teams that don’t want to spend the big bucks on a free agent. So buckle in, Tribe fans…it’s going to be an interesting hot stove. When I used to do recaps at Let’s Go Tribe, the general rule was to have them up on the site less than hour after the final out. That was great for maximizing the exposure of the recap, as well as capturing the emotion of the reviewer (having written the piece during or just after having watched it, heart rate still elevated), but it also limited the amount of sober analysis you could do. After all, when bringing up a late blown lead in your recap just moments after it happened, you aren’t likely to stop to think that maybe, perhaps that fatal pitch wasn’t that bad. The next morning you might start to think in more nuanced terms, but by then it was too late, the game window had passed, with another one just beginning. In baseball, there’s rarely time to ponder a single game because the next game is bearing down on you. I bring up this inside baseball (no pun intended) anecdote to illustrate the effect that Game 3 had (and still has) on me. I was fully prepared to write about it on Tuesday, the day after the game, but I still felt angry about both the game and the series, so I figured it would be best to wait a day. But on Wednesday, I felt the same way, still mad as heck about it. Thursday came, and yep, still fuming about how the team played. So here I am, on Friday night, five full days after Game 3, writing about it not because the anger has subsided but because it needs to be done, else it’ll fester in the back of my mind. When Terry Francona made the call to go to Trevor Bauer in the sixth inning, it was with the express wish that he would bridge the gap to Brad Hand. Preferably that meant Bauer would go three innings, meaning that Hand would only have to make a three-out save. How do I know this? Even if Francona didn’t explicitly state that after the game, the fact that no reliever got up until well into Bauer’s meltdown in the seventh inning would have done it just as clearly. Yes, Tito distrusted his bullpen to that extent that he was pinning his entire hopes on a starting pitcher going three innings have pitched in relief in both Games 1 and 2. And I should remind you that this in a game in which the Indians led 2-1. Despite the awful offensive production, the Indians had a chance to win Game 3 thanks to Mike Clevinger’s outstanding performance against the Astros. The bad thing about Clevinger’s outing in Game 3 is that it took him 99 pitches to get through five innings. With a functional bullpen, that kind of outing is perfectly fine for playoff game, but with the raging dumpster fire that is the Tribe pen, it wasn’t going to be good enough. It should also be noted that the offense, which had been among the best in the league as far as run prevention in the regular season, was just as culpable for the Game 2 and 3 losses as any Andrew Miller or Trevor Bauer or Cody Allen was. A reliever with a three-run lead is going to handle a situation much differently than one with a one-run lead, and perhaps have to pitch less cautiously may have helped with Miller in Game 2 or Bauer in Game 3. As much as I’ve been ragging on the bullpen, this embarrassment of an ALDS loss was a total team effort. I admit that the Astros have an outstanding collection of pitchers, but the Indians also had both an experienced and talented group of hitters to combat them. So when Francona called upon Bauer to pitch, he was placing the starter in as difficult a situation as you could think of. Bauer, who hadn’t pitched out of the bullpen at any time in 2017 or 2018, was throwing for the third time in four days, and he was going to have to go multiple innings against a lineup that by now was very familiar with him with a one-run lead. And the funny thing is that if Bauer can simply make a throw to second, he would have gotten through at least two innings having given the Indians a chance to win. If he doesn’t make either throwing error, he might have gotten out of the seventh with the lead. The events after Francona pulled Bauer actually validated Tito’s decision to insert Bauer into the game in the first place. Andrew Miller, Cody Allen, and Brad Hand, who on paper should have been the stalwarts of this series, allowed 6 runs and 1 inherited run to score in 1.2 innings pitched. When your best relievers are that bad, it’s just going to be impossible to win. Add to that a horrendous performance by the offense and some absolutely crucial errors (Melky Cabrera in Game 2, Trevor Bauer in Game 3) and you have the worst playoff performance in franchise history,* and although they had a legitimate chance to win two of the three games, statistically the series was one of the most lopsided in MLB history. Was this historic beat down attributable to the Astros just being that much better than the Indians? I don’t think it’s that simple an explanation. The Astros were a better team than the Indians just looking a superficial things like record and the caliber of their division. The Indians were fortunate enough to play in one of the weakest divisions in modern history, while the Astros had to contend with the 97-win Oakland Athletics, who pushed them in the division race up until the final weeks of the regular season. But the Indians’ preparation/scouting (at compared to Houston’s) was lacking, not to mention the horrible execution of that game plan. Given the talent the Indians took to battle, to lose in the fashion they lost is just unacceptable. So what now for the Indians? As mad as I still am with the way they played, they still have the makings of a great team. Their starting rotation, even accounting for some attrition (whether it be via injury or just diminishing abilities) is still among the best in baseball, and even if Michael Brantley leaves, there’s still a nice offensive core in place. The Indians have drafted well over the last several years, and that should help them be competitive on the trade market if that’s the way to want approach the offseason. A bullpen can be fixed without spending a lot of money or prospects, as opposed to the other areas on a team, though we didn’t see that play out in 2018. The AL Central still looks to be the Indians to lose even with expected improvements to every other team in the division. So this series loss, even as horrendous as it was, should not trigger any notion that the contention window is closed. But the Tribe front office has their work cut out for them, for reasons I’ll expand on in a future post. *The Indians were swept in the 1954 World Series, outscored by 11 runs over four games. In the 2018 ALDS, the Indians were outscored by 15 runs over three game. At the rate this is going, this series of posts is going to be rather limited. Game 2 transpired in a way I imagined the losses to be at the beginning of the series, with the starter leaving with a small lead, only to see the bullpen give it up at the end of the game. What I did not expect is that the 6th inning of Game 2 to be such a essential distillation of that imagined outcome. Carlos Carrasco was pulled in the sixth inning after allowing an infield hit (which was actually more of an unforced decision by Josh Donaldson, who picked up a squibber off the bat of Jose Altuve, even though it was going foul, because Altuve had stumbled out of the box) and a walk. Prior to that, Carrasco had had some difficulties, but seemed in control of the game. Andrew Miller came into the game, allowed a double (that should have been scored a single and an error), then lost total command and was summarily pulled in favor of Trevor Bauer. That inning encapsulated the team’s fatal flaw, something you could see playing out in the span of 10 minutes or so, which made it so visceral even to fans who didn’t follow the team that closely. That flaw is the bullpen, and particularly the relievers that two years ago were the bedrock on which an AL championship was built. By going to Miller in the sixth, Francona believed he was going to the Andrew Miller of 2016, but that Andrew Miller doesn’t exist right now. Perhaps in the future he’ll become a great relief ace again; I’m not declaring him finished as an effective pitcher. But I am saying that in 2018, he’s not somebody that is going to dominate a lineup, never mind get out of a jam like he was brought into in the sixth inning on Saturday. Had the Indians been able to discover/develop even a modest version of the 2016 Andrew Miller, I don’t think Francona would have brought in the 2018 Miller. Instead, with no real relief alternatives, he was banking on some residue of magic from someone who had at least done it in the past. Which is why I would have stuck with Carrasco in that situation, even though playoff doctrine dictates that you pull a starter at the first sign of real trouble. Rely on your strengths, even if that comes with risk, rather than casting your lot with your weakness. Carrasco was facing the top of the Houston order for the third time, but given what we know about the Tribe bullpen right now, I thought it was a more acceptable risk to allow Carrasco to face the middle of the Astros lineup for the third time than to bring in Andrew Miller to face them once. If you are going to lose the series, lose it by forcing your opponent to beat your strongest part. It also must be mentioned that the Tribe offense set the stage for that fatal flaw to be attacked. Scoring just one run in seven innings, no matter how great the pitcher, is not an acceptable outcome for an offense very capable of at the very least making a dominant pitcher work hard for his outs. This lineup is full of talented young players as well as experienced ones, and some of the at-bats against Gerrit Cole were just not up the standards that I’ve seen those players establish. And so we’re in the lamentable prospect of being swept in the first round of the playoffs. The good news is that teams have regularly come back from 0-2 deficits to win series, something that should be seared into Tribe fans’ minds after the events of last year. The bad news is that I don’t see how this team can do it in the absence of stellar starting pitching, with two of the starts being made by a rookie pitcher who is still growing into the majors (Bieber) and a veteran pitcher who was by his standards awful in Game 1 (Kluber). And even if the Indians get great starting pitching, I’m not confident at all that they’d be able to scrape together even two shutout innings in relief. I know a deficit brings out the pessimist in every baseball fan, even those who were pessimistic to begin with, but it’s really hard to see, after the lost opportunity in Game 2, to pull this series out. By nature, I’m an optimist when it comes to the Indians, especially over the last 5 seasons. I still think this team has at least one more run in them. But this year’s run? I think it’s over. Prove me wrong, Tribe. Please. After yesterday’s rather disappointing game (and that’s putting it mildly), there’s been a lot of thoughts swirling around my brain. This is an attempt to sort them out. In my mind the key to the Indians winning in this postseason is to rely heavily on the starting rotation. It’s apparent that Cody Allen isn’t the same pitcher he was in 2016 (or even 2017 for that matter), even after the numerous attempts to “fix” his mechanics during the season. Andrew Miller has alternated between injury and ineffectiveness the entire season, and while he may be at his best heading into the ALDS, that best is a far cry from vintage Miller, where you could put him in and immediately start planning for two innings from then. Brad Hand and Oliver Perez have been great additions, but aren’t going to be enough to cover the back end of a game unless the Indians get tremendous starting performances. That’s why yesterday’s game was so disturbing. The path to victory was that Corey Kluber would outpitch Justin Verlander, and the bullpen would hang on at the end. Had the Astros won in a close game or pulled away late, I’d be down (as for any postseason loss) but would be understanding of it. After all, a weak bullpen has been a given all season. But Kluber’s performance, beyond the line score, is what is unsettling. Kluber struck out just two hitters yesterday. Just two! His velocity was down at least two miles per hour. He was missing out of and in the strike zone. That isn’t just the Astros lineup not missing mistakes, that’s Kluber not being the Kluber that we’ve seen all year, even at the end of the campaign. I don’t think Kluber is injured, otherwise Francona would at the very least have elevated Carlos Carrasco to the Game 1/5 slot. That slot is very important, as the pitcher who starts Game 1 is the only starting pitcher to make two starts in the ALDS. After today’s loss, the chances that the Indians can both win the season and do it in 4 games is rather small, so Kluber is going to have to pitch again for the Indians to have any chance of advancing, and based on what I saw yesterday, that’s not something to look forward to, whether it’s bad mechanics (more likely) or injury (less likely, and let’s hope that it isn’t the case). This is where the strategy I laid out earlier collapses if the Tribe rotation isn’t at full strength. When Terry Francona reluctantly had to go to the bullpen in the fifth inning, the options just aren’t there to hold the opposition in check. Dan Otero and Adam Cimber made the postseason roster by default, not because they pitched their way into it. Neil Ramirez, the last reliever cut, has been awful over the past several months, so I’m not going to blame the roster choices for the performance, but the overall pool of players. That’s why I think Trevor Bauer is being used in a role that doesn’t suit his ability at all. Bauer was brought into a game in which the Indians were trailing in the sixth inning, replacing the guy who started the year as a co-closer. That should give an idea as to what Terry Francona thinks of the bullpen right now. And if you have to use Bauer in a short relief role, you can’t use him as a bridge type of pitcher or even as a starter in the series. I imagined Bauer’s role as a finisher, coming into the game in the sixth or seventh inning and pitching the remainder of it, like the Astros used Charlie Morton in Game 7 of the World Series last year. That’s why using Bauer in as low leverage a situation as you can get the playoffs was so puzzling. Sure, don’t plan on Trevor going deep into a game, but for goodness’ sakes, he’s one of your best 3 pitchers on the roster even after the injury! The Indians have the talent to still pull off the series win, so don’t take the preceding as a acknowledgement of impending defeat. But as yesterday’s game showed, in order for them to win, the Indians absolutely need Carlos Carrasco, Mike Clevinger, and whoever ends up starting Games 4 and 5 to be at the top of their games, because if it becomes a bullpen game, the Indians are going to lose. 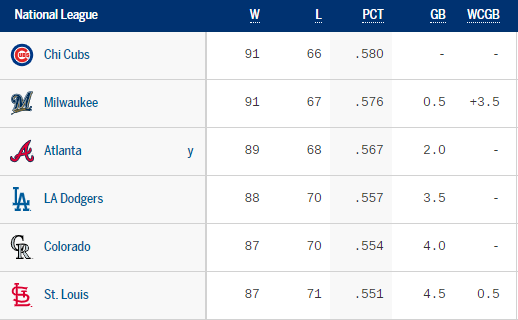 The Cardinals were eliminated from contention with the Dodgers winning yesterday, meaning that all four of the teams pictured above are in the playoffs, but they want to avoid playing in Tuesday’s single-elimination Wild Card game, even if that means having to play a tiebreaker tomorrow. 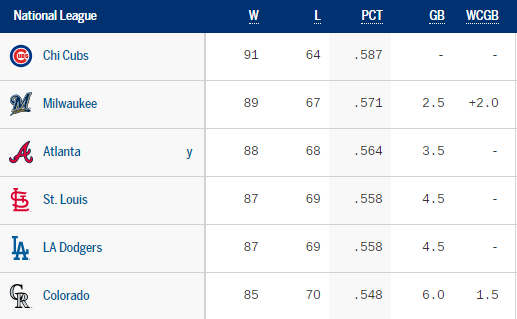 The calculus is simple: if the Cubs/Brewers and/or Rockies/Dodgers are tied in the standings after today’s games, they’ll play a tiebreaker on Monday*, and the loser(s) of those games would have to play in the Wild Card game on Tuesday, with the NL Central team hosting the NL West team. Because the pairs are tied, the concurrent start times (at 3PM Eastern) won’t make the teams play any different than they would if the games were staggered, but as a fan, it makes this afternoon absolutely fantastic. All four games will be decided within a 3-4 hour window. Of the four pitching staffs, I think the Rockies may be the best positioned, as they were blown out yesterday, and therefore didn’t use the back end of their bullpen, while the other three teams did. That may come into play Monday or even Tuesday, as you’d have key relievers pitching for the fourth (or even fifth) day in a row. No matter what happens, at the very least we’ll have an afternoon of compelling baseball on this final day of the regular season, a nice appetizer for October baseball. *Cubs would host the Brewers, while the Dodgers would host the Rockies. St. Louis has ruined any possibility of a multi-day tiebreaker in the National League by losing four straight games, but with two days left in the regular season, there are still three different possibilities for tiebreakers, with two of them being mutually exclusive (NL West and Wild Card #2). So there could be two tiebreaker games played, with both of them on Monday. This one is rather simple. The Cubs lead the Brewers by a game, with both teams having clinched playoff spots. If they do end up tied, they’ll play a tiebreaker, with the loser hosting the Wild Card game. Either team would win the division outright without having to play a tiebreaker. The Rockies have clinched a playoff spot, meaning that the Dodgers would clinch one as well if they catch Colorado. It would be a similar scenario as in the NL Central, with the loser heading to either Milwaukee or Chicago for the Wild Card game. Either team could still win the division outright without playing a tiebreaker. If the Cardinals win out and the Dodgers lose out, they would play a tiebreaker for the second Wild Card spot. With only 2 days left in the regular season, that’s kind of crazy that there are still that many possibilities. Meanwhile, in the American League, there is absolutely nothing at stake (including seeding). So thank goodness for the NL! The 5-team tie is still possible, but there is no more room for error, as now the record has to be 91-71, not 92-70, as the Cardinals cannot get to 92 wins now. The Cubs have done their part, losing two straight at home to the Pirates. St. Louis losing two games at home to the Brewers is what is gumming up the works, though. The Cubs would have to lose all 5 of their remaining games, which normally would seem very unlikely, but 3 of those games are against the Cardinals. The biggest hurdle to tiebreaker chaos is actually the Brewers going 0-4 to end the season, as 3 of those games are at home against the lowly Detroit Tigers. If St. Louis defeats the Brewers tonight and the Cubs win, the best outcome would be a four-way tie involving the Brewers, Dodgers, Rockies, and Cardinals. That would mean the Dodgers and Rockies would play on Monday to decide the NL West, with the losers participating in a three-team, two-day tiebreaker with the Brewers and Cardinals. The same records would apply as in the five-team scenario above, just with the Cubs removed. In this scenario, the Cubs would still win the NL Central even if they lost their final four games. 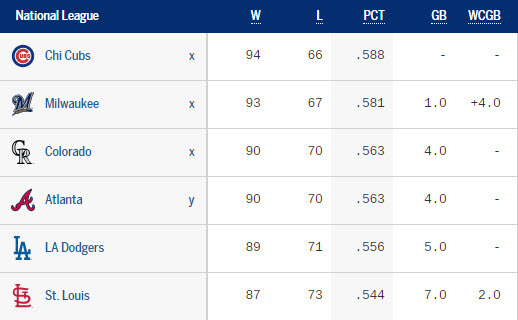 If St. Louis loses to Milwaukee tonight, the best outcome for tiebreaker aficionados would be two separate ties; a tie for the NL Central (Cubs-Brewers) and a tie for the NL West (Dodgers-Rockies). This has many different ways to happen, given that both division leaders are hanging on by just one-half a game. The two losers would then face each other in the NL Wild Card game. As someone who yearns one year to see a crazy series of tiebreakers at the end of the regular season, the National League presents a very intriguing scenario, in contrast to the American League (which might have all the seeding complete before the weekend). There is a possibility of having 6 teams in the NL finish with the same record, and 5 of those teams having to play at least one tiebreaker (Atlanta has already clinched their division, and they wouldn’t have to participate, as determining seeding in the NLDS doesn’t require a tiebreaker game). Colorado has the longest odds, as not only do they have the worst record of the contenders, but have to rely on outside help to get them into a tiebreaker, while St. Louis largely controls their own destiny, as they play both Milwaukee and the Cubs this week. There are many other less crazy scenarios even if this one doesn’t line up, but for now I’m rooting for the five-way tie. I’ll update these scenarios as the season draws to a close. As life goes, so does baseball. The Indians are going to appear in the postseason for the fourth time in six seasons, and while this playoff appearance has a lot to do with the division they play in*, the overall accomplishment is quite a satisfying one, given that mid-market teams like the Indians have the deck stacked against them before they take the field on Opening Day even with recent compensations. When last the Indians did such a thing (1995-2001), they had a new brand new stadium, their main competition for entertainment dollars had left town, and the revenue balance wasn’t nearly as off-kilter as it became in the 21st century. This stretch of good-to-great baseball came with none of the external helps, unless you count Terry Francona as a deus ex manager. There wasn’t that long stretch of futility that elicits joy over even a slight success (witness the celebration over the Browns’ first victory in 19 months), there was competition for attention from the Cavaliers (because of LeBron James) and the Browns (for merely existing), and the team was outspent during its 2013 season by every other team in the division (including the Royals); they were wildly outspent by the Tigers until this year. The fanbase remained interested even during the fallow periods (see high TV ratings) but were not and are not opulent ticket buyers. So this dynastic period of Indians baseball was driven mainly by good decisions by the front office and coaching staff, something I’m itching to look at in great detail some cold winter day. Entropy always wins out in baseball, though. The team has had a historically great pitching staff, driven both by talent but more importantly health. The front office has done a good job of avoiding a catastrophic contract millstone (when Jason Kipnis has the worst contract on the roster, that’s a good thing), but the passage of time in baseball terms means both more expensive players and a degradation of ability. Most of the players we know and love on this team will either not be in an Indians uniform in 2020 or be as effective. And that’s just assuming a normal turn of events; there always will be shocking turns. As a baseball, I should expect at least competence from the team you follow, and occasionally excellence. That’s what the baseball people expect from themselves, after all. But there are also 29 other fanbases and front offices with the same expectations, and though some fall well short, there are enough who don’t to make continued success a rare feat (unless of course, they reside in a golden market). So I’m enjoying everything remaining about the 2018 season. Enjoying the meaningless games left on the schedule. Enjoying the fact that there will be meaningful games to come. Enjoying the playoff games after the fact, as there’s no way that I can enjoy and be terrified of something at the same time. *Even stating that the competition is obviously historically bad, the Indians were just a couple early-season injuries or bouts of ineffectiveness to the rotation from keeping pace with the Twins (as the Tribe’s dominant starting staff covered for a hideous bullpen by throwing the most innings in baseball), and if the Twins were within 5-6 games after the All-Star Break, they don’t unload in July, and who knows what would have happened after that? I guess what I’m saying is that no MLB team is ever guaranteed to make the playoffs no matter how massive the perceived advantage. As what’s left of Gordon has made a hash of this weekend’s outdoor plans, what better way to spend this unexpected fallow time than opining over the state of the Cleveland Indians as they prepare for the playoffs? It’s been a while since I wrote anything specific on the Indians in this place (or anything at all for that matter), and there’s lots of interesting sub-plots to cover. The drama had long been taken out of this season, what with the Twins regressing, and so all that is left to worry about is how the team will be structured for the ALDS. It’s been a weird season, in that the Indians have basically won the division in June despite having at one point only the sixth-best record in the American League. It’s also weird that the team played their best baseball after the division championship became a given. The closest season analogue is probably 1999, a team that ran away with the division (led by 10 games on June 15th). That club would score 1,099 runs, but lost in the ALDS to Boston largely because they didn’t have enough starting pitching for even a 5-game series (although if not for Mike Hargrove making a major strategic error, they might have won it anyway). And so for the final three months of the season, both Terry Francona and the Tribe front office has had the luxury of not having to worry about the short-term, giving key players time off when they need it, sending players to the Disabled List for any type of physical ailment, and remaining patient with a slumping veteran. Most deadline trades are made with the idea of getting into the playoffs in the first place, but the Indians made their deals with the ALDS (and beyond) in mind. To that end, each of their July acquisitions (Brad Hand, Adam Cimber, Leonys Martin, and Oscar Mercado) are under team control through at least 2019. So while winning a championship in 2018 is still the top priority, a lot of the moves were made with this offseason in mind. The Indians are going to be the first team in baseball to clinch their division despite having the shakiest bullpen of any contender (though the Colorado Rockies might quibble with that). Like the Rockies, the Indians have succeeded in the standings because they’ve minimized the innings that their weak bullpen has had to pitch thanks to having one of the best starting staffs in baseball. The Tribe bullpen has thrown 387.2 innings, 35 fewer than their closest competitor (Houston, with 422.1 innings). Playoff games tend to see shorter hooks than a regular season game, and the Houston Astros (at this point it would be a shock if any other team is the ALDS opponent) are going to make it a point of emphasis to drive up the pitch count of the starting pitcher so that they can get to that shaky bullpen. In the best of worlds, a bullpen with Brad Hand, Cody Allen, and Andrew Miller at the top of their games, along with support from Oliver Perez and Adam Cimber could get the job, assuming the starter can go six innings or more. But right now we’re not in that world, what with both Allen and Cimber struggling and Andrew Miller still trying to get healthy. There have been no signs that Dan Otero or Neil Ramirez will be of any help in October, and to that end Terry Francona has been trying out guys like Jon Edwards to see if he can find that final reliever for the playoff roster. But at this point I’d bank on the five mentioned in the first sentence of this paragraph plus at least one starting pitcher in the bullpen for the ALDS. In 2016 Francona leaned on his bullpen for lack of starting pitching; this playoff run, if there is to be a deep one, may depend on leaning on the rotation for most of the playoff innings. On August 31, the Indians shocked practically everyone by acquiring Josh Donaldson from the Toronto Blue Jays. It’s not shocking that the Jays would try to trade the pending free agent (who supposedly wasn’t getting along with management), but that the Indians would be the team to trade for him. After all, the Indians had Jose Ramirez ensconced at third base, who was in the midst of having one of the best seasons by a third baseman in franchise history. The trade set in motion a series of positional changes, with Ramirez to move to second base, and Jason Kipnis to share time with Greg Allen in center field. In short, Josh Donaldson is going to make Kipnis a part-time player, which brings with clubhouse ramifications. After all, Kipnis has been a core player since the beginning of the playoff run in 2013, and is under contract ($13.67M) through next year. Assuming Donaldson leaves after the season, Jason Kipnis would be the front runner to return to second base, so Terry Francona is going to earn his salary in handling both Kipnis’ playing time as well as mental state through the rest of the season. Kipnis for his part has hit better in the second half, and especially of late (.947 OPS over the last two weeks), and if that continues through the end of the season, Francona would have more than enough justification to make him the starter in center field for the playoffs (with Allen, Guyer, or even Rajai Davis playing against a left-hander). All this juggling is necessary because of Leonys Martin’s life-threatening bacterial infection; thankfully Martin has recovered from it, but won’t be able to play again this season. This all assumes that Josh Donaldson is both healthy and hitting by the time the playoffs roll around. After acquiring him, the Indians decided to place him back on the Disabled List (he was on Toronto’s DL when the trade happened) in order to get him more rehab at-bats. As a side benefit, the DL stint also helps him avoid this weekend’s series in Toronto. And so Donaldson has played three games with the Akron RubberDucks in their Eastern League playoff series, and should be ready to go on Tuesday. He’ll then have about three weeks of major-league games to get in hitting shape for the playoffs. When healthy, Donaldson has been one of the best hitters in baseball, and would lengthen a lineup that for a good portion of this season has been very top-heavy. Melky Cabrera, who I derided both here and in the Let’s Go Tribe comments, has been one of the most productive players on the club in the second half, hitting .312/.379/.500. He’s been especially good against left-handed pitching, which has led Terry Francona to try playing Brandon Guyer in center field when they face a southpaw. Cabrera is still an awful defender, but his re-emergence has plugged a massive hole in right field left by injuries to both Lonnie Chisenhall and Tyler Naquin. Martin was horrendous in his first stint with the Indians, but because he cleared waivers after the Indians designated him for assignment in June, was able to return for a second time, and this time has stuck. If you would have told me in May that Melky Cabrera would be the starting right fielder in the ALDS, I would have despaired for their lineup, but I am so glad to have been proven wrong. Yandy Diaz has started to hit at the major-league level, which has been welcome to see. He has a rather unconventional hitting profile, whacking singles and the occasional double, but rarely hitting the ball out of the park. He’s not a slap hitter at all (his average exit velocity of balls put in play is 92.5 mph, one of the best in baseball), but he doesn’t elevate the ball much at all. Since he got a week’s worth of regular playing time in August thanks to Edwin Encarnacion’s sore arm, he’s hit whenever he’s in the lineup. But he doesn’t really have a home position, which makes it difficult to find playing time for him on a club with an everyday DH. And that raises the question as to whether there will be a spot for him on the ALDS roster. For him to have a spot, he needs a role, and the only role that makes sense right now is of a pinch-hitter for Yonder Alonso, though he’ll also need to prove his defensive chops at first base. To this point he hasn’t started a game as a first baseman, but I’m hoping Terry Francona will get him some chances there as the season winds down. With Alonso struggling in the second half (.671 OPS), perhaps by the time the playoffs begin Diaz will even nab a start from Alonso (against Dallas Keuchel).